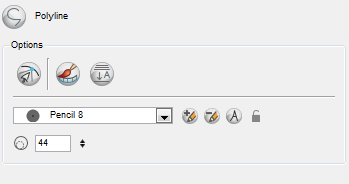 When you select the Polyline tool, its properties and options appear in the Tool Properties view. ‣ Maximum/Minimum Size: Defines the minimum and maximum width of the stroke. 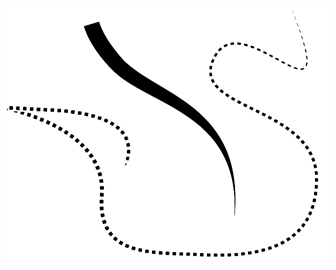 ‣ Smoothing: Defines the number of control points added to the centre line. ‣ Contour Smoothing: Defines the number of control points added to the contour boundaries (around the line). Lower values mean that the line will appear as you draw it (with more control points added along the centre line). 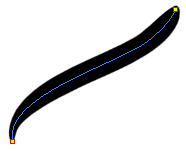 Higher values mean that the line will be smoothed out (removing control points from the centre line). The Snap to Contour option will snap your selection to any line you position it on. As you draw in the Line Art layer, the Create Colour Art Automatically automatically creates the corresponding strokes in the Colour Art layer. When enabled, the Auto-Flatten mode automatically flattens the new lines created with the existing artwork as you draw in the Drawing or Camera view. Brush strokes will flatten with brush strokes and pencil lines will flatten with pencil lines. Toon Boom Harmony gives you the flexibility to change the style and thickness of your pencil lines even after they are drawn. You can apply preset templates or create your own. Refer to Working with Templates, Creating a Pencil Templatewith the Select Tool and Applying a Pencil Template. Use the Size Adjustment field to set the thickness of the shape’s line. 1. Size: Type a value in this field to set the shape’s line thickness. 2. Up/Down arrows: Use the up and down arrows to modify the value contained in the Thickness value field.